This blog post is the second in a five part series on the "Four Pillars". If you'd like to start from the beginning, you can find the first post here. When Bitlink first started, the core team was predominantly made up of people who had either worked at, or graduated from, the Human Interface Technology Laboratory (HITLab) at the University of Tasmania. The HITLab was a fascinating place to work and study. The core mission of the HITLab was to explore new ways in which people can interact with technology. The HITLab had a particular focus on applying emerging ideas in interface design to different problem domains. While we were at the HITLab the Bitlink team worked on a number of virtual reality, augmented reality, gesture based and tangible user interface projects, in fields as diverse as nursing training, environmental data visualisation, primary education and disability support. When we left the university to start Bitlink, we brought our interest applying novel interfaces to a diverse range of problem domains with us. We wanted to work on projects that would enable us to explore new ways of interacting with technology and to start at the most basic level when it came to interaction and experience design. Rather than starting from an assumption that we will be building something for a touch screen, or that we will be building something for a keyboard and mouse, we begin each project by assessing what the best interaction methodology might be to achieve the project's intended aims. There are plenty of businesses out there building software for keyboards and touch screens. We wanted to be a business that people could come to if they had a problem where keyboards and touch screens might not be the most effective approach. By including novel interaction in our Four Pillars, we eliminate an initial assumption from all of the projects that we undertake. Rather than assuming that we will be working with the standard interfaces of the day (presently keyboards and mice, or touch screens on mobile devices), we begin each project with an exploration of a variety of interface methods which might be appropriate for a given application. Sometimes, the best approach to a project involves instrumenting a real environment with sensors and enabling people to interact with the software by interacting with their environment directly, sometimes the best approach to is create a virtual reality or augmented reality application, and sometimes the best approach really is a desktop or mobile application, but one which in turn interacts with the real world in some meaningful way. Some of our favourite projects are ones where the interface, and the computers that run it, become invisible to the end-user. In some cases, our projects don't have screens, but instead confer information to users through ambient interfaces, such as lights or sounds that respond to a user's actions. At the heart of our focus on novel interaction is a desire to explore the future of computing and the future of technology use more generally. By eliminating the initial assumptions about how users might interact with anything we might build, we dramatically increase the number of options for how to approach a project, which in turn creates new challenges relating to design and scope definition. However, by being open to new approaches to interaction, we can better ensure that anything we build creates the best possible experience for the people who use it. Oculus Rift: An example of a virtual reality headset. The core focus for us at Bitlink is to ensure that whatever we're building, we have given some real thought to how best to design for positive user experience and effective interaction. In some cases, this means building something completely custom, including custom hardware and physical objects that will form the core interface. In other cases, it means using an existing approach to interface design (such as virtual reality, or ambient interfaces) and applying those to a new problem domain. Sometimes, our projects also require a more traditional interface component (such as a web site or mobile application), which form part of a larger user experience that also includes more novel interface elements. While each project is unique, there are a number of interface approaches that we regularly explore at Bitlink. While these are good, indicative examples of the sorts of things we work on, they're really only a small sampling of the different interface ideas that can be at the heart of any given project. Virtual reality applications use headsets or visualisation facilities to completely occlude the real world and create a sense that the user is actually inside a 3D world. An example of a virtual reality application is an educational game in which you wear a headset and explore the world from the perspective of an insect. Augmented reality applications add digital content to the real world, in a way that makes it appear as though the real world and the digital content are connected. An example of an augmented reality application is a comic book that comes to life when you look at it through a mobile phone camera, with the characters from the comic book appearing to pop out of the page in 3D. 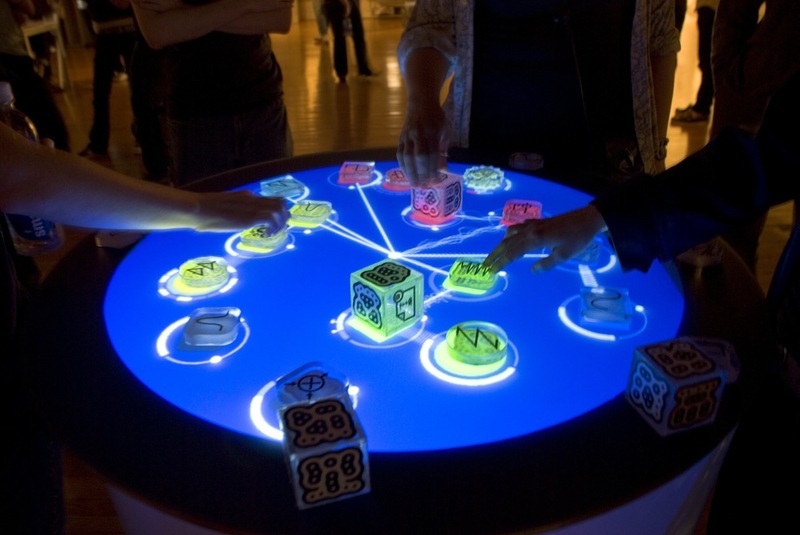 Reactable: An example of a musical instrument that is built using a tangible user interface. Music is created by positioning cubes on the table, rotating them, and creating links between cubes. Tangible user interfaces enable users to interact with digital information by directly interacting with the real environment. An example of a tangible user interface is a musical instrument that you play by moving blocks around on a table. Wearable devices enable people to interact with a computer by wearing something. An example of a wearable device project might be a pair of bracelets that help you navigate on foot in an unfamiliar city by vibrating when you need to turn left or right. Ambient displays are displays that provide information in a way that seamlessly fits into the user's immediate environment. An example of an ambient display is an orb that changes colour depending on whether you've recently got up from your desk and gone for a walk, and which might blink when you've been sitting too long and really should get some exercise. There's quite a bit more to interaction design than we've been able to cover in this post, but hopefully this provides a bit of an overview of the sorts of things we look for when we look for "novel interaction" and some of the common characteristics of projects that we work on at Bitlink. Of course, this is a field that is evolving all of the time and with every project we tackle, we learn new lessons about what works and what doesn't and how best to align the interface with the intended project outcomes and user experience. If you think you have a project that might be a good fit for us, or if you'd like to talk to us about the work we do, then please get in touch. You can reach us through our contact page. This blog post is the second in a five-part series on the "Four Pillars" that the Bitlink team use to determine which development projects to focus on at any given time. Projects that align with the four pillars are actively pursued, projects that don't fit the mould are declined or referred on.